As is true of all painting jobs, the key to painting concrete is proper cleaning and surface preparation. Once the concrete is ready, applying paint is a simple matter of spraying or rolling on a primer and the paint. After painting, you'll want to seal your pavers to protect your newly applied color. Painting is an ideal way to spruce up dull, gray concrete and give it some zest. Their durability and strength make concrete pavers an excellent choice for patios, driveways and walkways. Check the weather. When working outdoors with paint and concrete sealer, the temperature should be 50 degrees F or above. Delay your painting project if rain is in the forecast. Sweep away any dirt and debris before priming and painting pavers. 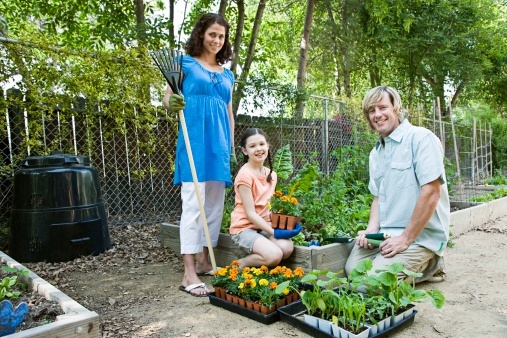 Pull any weeds that are growing between your pavers and then brush away any loose dirt or sand with a broom. Treat any stains on your pavers so they don't show through the paint. Rust stains and efflorescence are difficult to remove and typically require store-bought chemicals from the hardware store. Sprinkle cat litter or another absorbent material over old oily stains and let it sit for six hours before sweeping away the material. If a paver is badly stained and resists stain removal, you can replace it before painting. Soapy water will remove most dirt from concrete pavers. Pour some household dishwashing detergent into a bucket of water. Pour the solution on your pavers and scrub them with a stiff broom. Allow the solution to sit for 15 minutes. Rinse off the pavers with a garden hose. 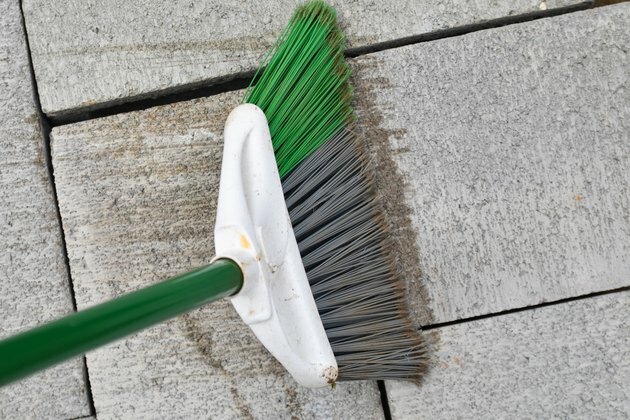 Sweep off any puddles with a broom and allow your concrete pavers to dry overnight. Spray or roll on a coat of concrete primer. Allow your pavers to dry completely. Apply a layer of acrylic cement paint with a roller or sprayer. Allow the paint to dry for the time recommended on the paint label. When in doubt, let the paint dry for 24 hours. Apply a second coat of paint and let it dry as well. Apply at least two layers of concrete sealant, with the recommended drying time between coats. Use a clean paint roller or sprayer to apply sealant just as you did the paint. Avoid walking or driving on the pavers until the sealer has cured. This process typically takes about 48 hours.